When Seattle Northwest Yachts LLC made the decision to build two lines of new yachts, managing partner Peter Whiting knew he needed a design and build team that was more than just highly talented. He knew he needed a team that also had an unmatched depth of real-world background — not only in yacht construction but in both sail and power yachting as well. For all the grand plans in the world inevitably amount to little without the practical experience needed to turn those plans into reality. The Seattle Northwest Yachts design and build team brings together nearly two centuries of combined yacht design and construction experience. Just as importantly, every member of the Seattle Yachts design and build team has been involved with boating since a young age and displays a driving love for yachts and yachting. Which makes all the difference in the world. Stephen R. Seaton, Seattle Yachts’ principal designer, has been actively designing sailboats and motor yachts for more than 50 years, with some 560 different designs amassed to his credit. Seaton was instrumental in the design of the first yachts built by now world-renown Delta Marine of Seattle — perhaps the most well-known of which are the 62-footer Zopilote and the 110-footer Onika. Onika was named Best in Class in a Showboats International magazine competition the year she was launched. And the next year, Seaton won the same award for a 105-foot trawler yacht to his design. On the boatbuilding side, Seaton was one of three key players in the original formation of Northern Marine in Anacortes, WA, where he functioned as Chief Designer and where the globe-girdling 76-foot Spirit of Zopilote was built under his watchful eye. The practical understanding that grows out of Steve’s experience in owning and running a shipyard distinguishes him among yacht designers and is, in part, what makes him a vital part of the Seattle Northwest Yachts program. 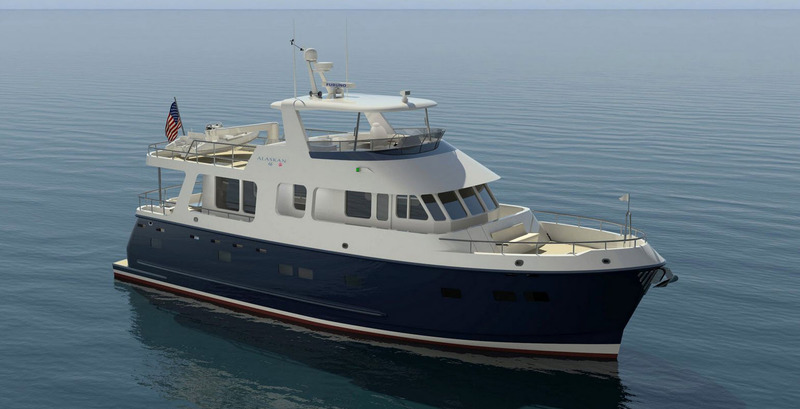 Peter Whiting, managing partner of Seattle Northwest Yachts LLC, is the developer and co-designer of the Northwest line with models from 45 to 75 feet LOA, including the firm’s flagship Northwest 63 currently under construction. Peter is a lifelong boater, having learned to sail in Northern California at the age 11. Over the years, he has boated extensively in various areas of North America, from New England to the waters of the Pacific Northwest and in between. With his extensive sailing and cruising experience, Peter brings a knowledgeable and seasoned viewpoint to the table. In 1998, he purchased Northwest Yachts and subsequently developed and built a series of Northwest trawlers and expedition-styled motor yachts. Then, in early 2016, he amalgamated Northwest Yachts and Seattle Yachts into a single yacht dealership and brokerage under the trade-name Seattle Yachts. When the opportunity arose, in late 2017, to acquire the trademark rights and intellectual property of Alaskan Yachts, Peter did so with the intent to re-develop and reintroduce to the market the history-rich and value-laden Alaskan trawler-yacht line. Phil Friedman serves as Seattle Yachts’ New-Build Manager, making sure that the team’s designs and plans get translated accurately and effectively into real-world product. Phil has a long and broad-ranging history in the marine industry, as a yacht builder, boat and shipyard manager, small-craft surveyor, and yachting writer and editor. He was for several years the president and CEO of world-class mega-yacht builder, Palmer Johnson Yachts, during which time the company, under his supervision, developed, built, and refitted nearly two dozen luxury mega-yachts in the 30- to 60-meter range. Over the course of a multi-year tenure as Senior Editor of Power & Motoryacht magazine, Phil tested and evaluated hundreds of yachts worldwide. He has published more than 1,200 articles on yacht design, construction, repair and maintenance. And his recently published eBook, Ten Golden Rules for Successful New Build Projects, has received wide acclaim from industry professionals. Phil’s more recent work includes managing the construction of an 80-foot cruising motor yacht in Taiwan; supervising the ship-fitting for a 45-meter composite military patrol vessel; the project management of prototype construction for a new line of 65-foot high-performance catamaran motor yachts; and the design and supervision of the fabrication and installation of ultralight interior joinery and furniture for a number of high-performance Hovercraft military patrol vessels. Phil is veteran sailor with seven years liveaboard cruising experience and some 40 years of sailing on the Great Lakes, as well as on the waters of Florida, the Bahamas, and the Caribbean. More information on Phil’s long and varied career can be found by running a Google search on “phil friedman yacht”. Bill Macnab is the Production Manager for the shipyard with whom Seattle Yachts is strategically partnered for the tooling and construction of the Northwest and Alaskan yacht lines. Bill has been a professional boat builder nearly all his life. He built his first sailing dingy in 1965 when he was only 6 years old, with some help from his dad, using FRP to seal the dagger pockets. He later found work in a local boatyard, Cooper yachts — which eventually became Cooper-Queenship — where worked for Forbes Cooper for 14 years. Eventually, Bill bought the tooling for a line of pilothouse sailing yachts from Forbes and started his own Company, North West Yachts (not to be confused with Northwest Yachts). Following a stint in cabinetmaking, Bill completed a formal boatbuilding apprenticeship at the Cooper yard, then accepted a management position with West Bay Yachts in the production of their 105 line, where from 1997 to 2007, he built more than a hundred West Bays, mostly in the 100-foot plus range. As yacht building began to expand in China, Bill took on the job of helping to construct a new facility in Zhuhai, where the newly-formed Tricon Marine was getting ready to build its first 92' explorer yacht. More recently, he moved to a shipyard in the Fuzhou area in Fujian province, not far from areas where several major North American yacht brands are currently being produced. Paul Thunberg grew up in a small landlocked town in Northern California. He discovered sailing after building a 12-foot plywood sailboat from plans found in a popular Mechanics Magazine. Paul later worked as a welder/fabricator at several shops building everything from houseboats to tunnel boring machines and, after moving to the San Francisco Bay area worked for Stone Boats building wood and fiberglass boats. While living in San Francisco, Paul completed a Bruce Bingham designed Flicka hull and deck kit that was produced by Pacific Seacraft… and set sail for Hawaii, teaching himself celestial navigation on the way. After his cruising funds ran short, Paul returned to the mainland where he enlisted in the U.S. Coast Guard, eventually serving 21years on active duty as a mechanic and deck watch officer on vessels ranging from 41 to 140 feet. After retiring to the Portland Oregon area, he retired from active duty and accepted a position as a civilian employee for the Coast Guard at Marine Safety Unit Portland. Paul graduated from the Westlawn School of Yacht Design under the tutelage of well-known designer Dave Gerr and has worked as an associate-designer on several Stephen R. Seaton projects, as well as pursuing his own design work. Jan Whiting specializes in interior design and space utilization planning for new-builds and major refits. She was the driving force behind the very popular and successfully interiors of the Northwest 45s and 52s developed and built in Anacortes in the early 2000s, as well as those of the Integrity line. With additional experience in restaurant and resort facilities planning, design, and management, Jan exhibits keen insight into what makes for comfortable living on a longer-term basis. She grew up in Baltimore around the water and came to love boats at an early age. In those days, her father would take her sailing aboard his Krogen ketch on Chesapeake Bay. These days, living and working in the Pacific Northwest, Jan gets out on the water at every possible opportunity. Her favorite cruising grounds range from the Pacific Northwest to Alaska. And some of her most cherished memories include sailing down the Baja peninsula to La Paz and visiting several Croatian sailing spots last summer aboard an Elan. When she’s not out on the water, Jan spends time scouring the major boat shows for new ideas and applications that might be adapted to advantage in Seattle Yachts’ Northwest and Alaskan lines. Her assistance is also available, as a value-added service, to help new-build buyers develop interiors for their Northwest or Alaskan yachts that will stand the test of time for extended living and cruising aboard. She is, moreover, a great sounding board for those preparing to make the transition from shore-based to water-borne living. Donald L Blount and Associates provides professional naval architecture and marine engineering for Seattle Yachts projects. Founded by prominent naval architect Donald L Blount, DLBA is currently headed by director Jeffrey Bowles who holds a degree in naval architecture from the Webb Institute and a master’s degree in marine engineering from the University of Newcastle. DLBA itself is now a subsidiary of Gibbs and Cox, which has been the pre-eminent authority in fiberglass marine vessel construction for more than half a century.